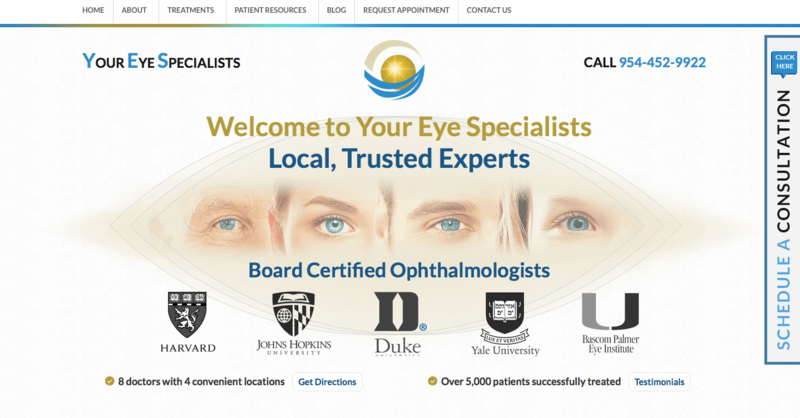 This group ophthalmology practice had a dated website that poorly showcased the doctor team. 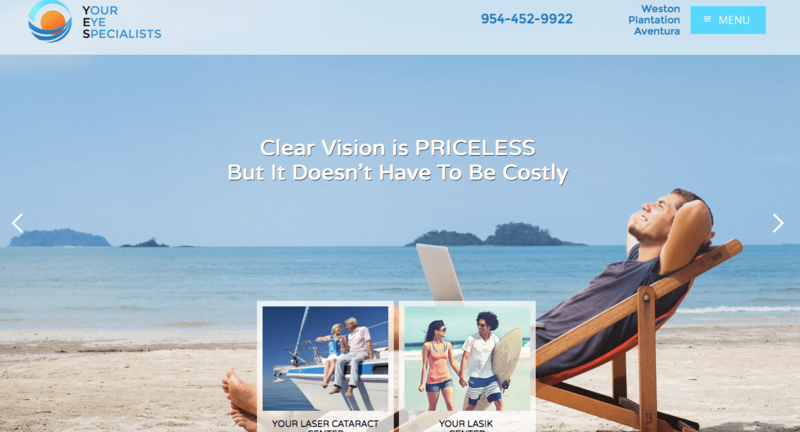 Based in a handful of locations throughout South Florida - Weston, Aventura, Pembroke Pines, Miramar - visitors to the website had no ability to differentiate these doctors from their local competitors. By redesigning the website and showcasing their expertise and educations the entire feel of their online presence and brand shifted positively. Harvard, Yale, Bascom Palmer, and Duke education and training is the new focus of the website along with easy navigation, modern and current layout, and appealing color scheme. 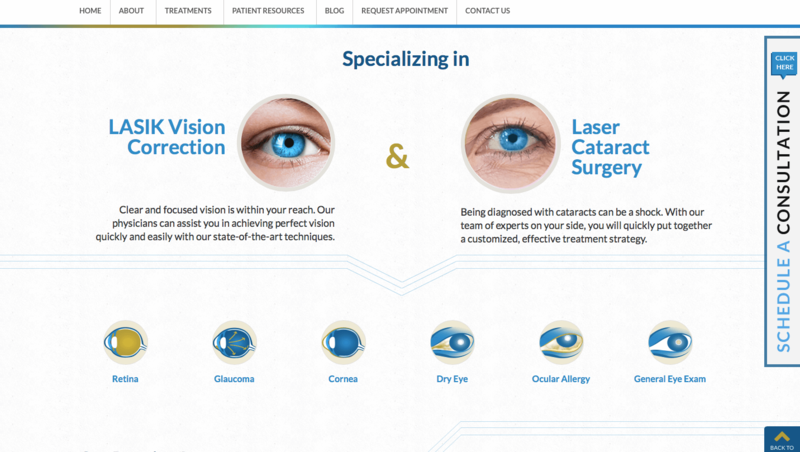 We believe this is arguably the finest website nationally for ophthalmologists utilizing nearly every cutting edge technique available. Read further to see the transformation, which coupled with superb SEO, will change the results and rankings of this website for years to come. The initial website designed by a non-SEOversite vendor was low-information. A few stock photographs, a phone number and locations, and that was about it. 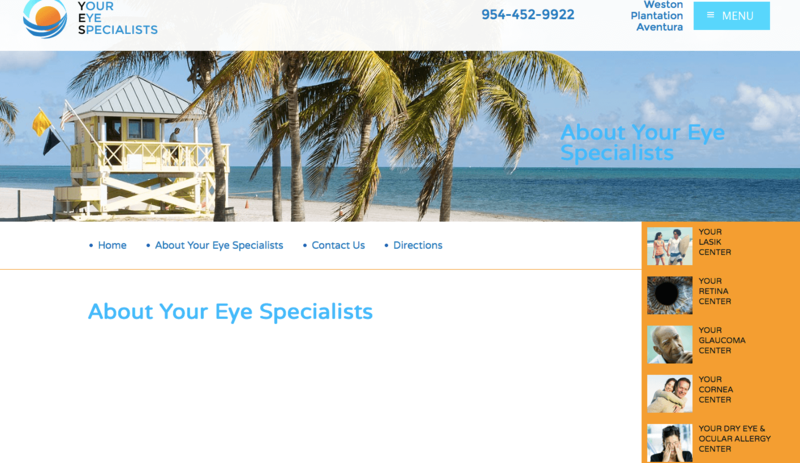 Through helping the client find a better web development team, who not only had strong design skills, but also understood strategy, we were able to completely change the feel and look of the site and ensure potential patients knew, within 10 seconds, that they had found the right practice to visit. Scroll down past the next interior page screen shot of the old website to see the "after." More low-information screen shots of the prior website. 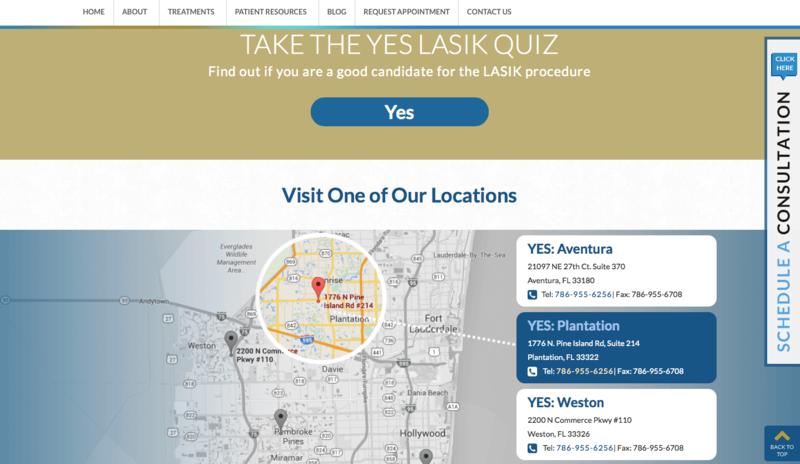 Here we have the brand new home page of the YESEyes website. We have clean, easy-to-navigate above-the-fold area with immediate showcasing of the Ivy League education, years of experience, thousands of cases performed and other key trust signals a group practice needs to differentiate themselves from competitors. SEOversite avoids "cookie-cutter" websites that look the same as everything else in a given market. At the same time, care and attention must be paid to ensure design does not get in the way of function. Here we see a clear and understandable navigation page which avoids the typical feeling of rectangular, scrolling web pages which have started to look dated and tired. 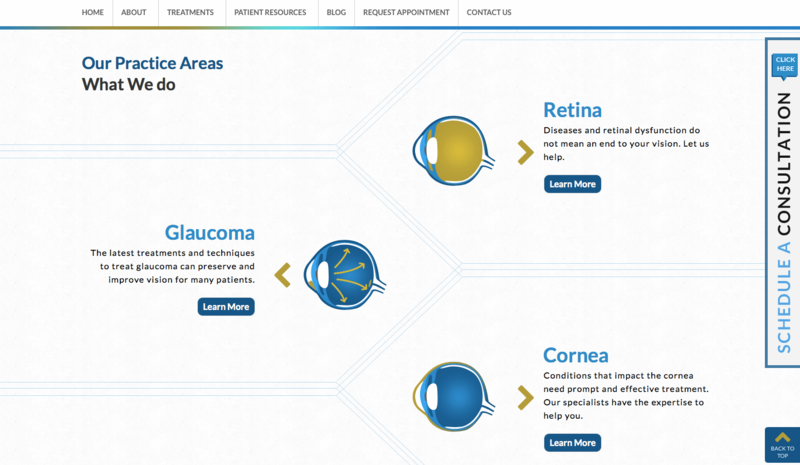 Continuing the theme of organic design with easy navigation while avoiding the tired "rectangles on top of rectangles" website design concept, we form a visual map of those seeking better vision. Visionary? We think so. That's right. The former web team took the website live without any information about the doctors and never followed up to ensure some information was added or was populating properly. Unfortunately too many web teams rush, are unable to manage busy business owners, or simply do not care. Even more amazing is many business owners try to build their own websites from scratch despite revenues in the 6, 7 or even 8 figure range. 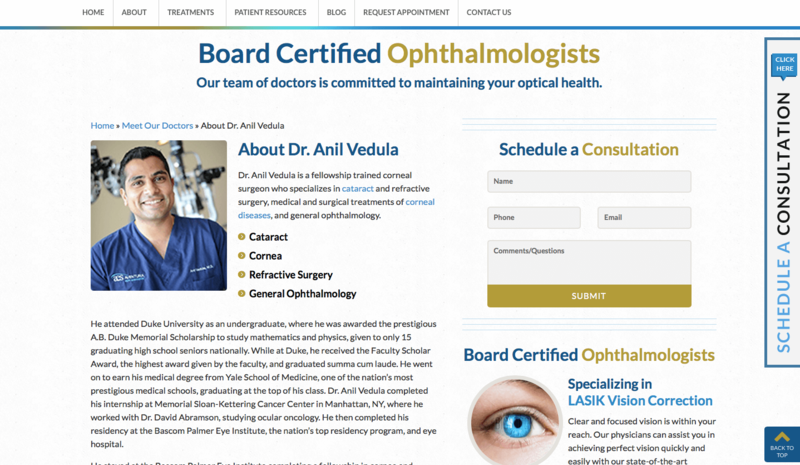 This website in its prior form was doomed, but scroll down to see the "after" page we created for one doctor in this group practice. Trust signals. Key bullet points for those who wish not to read. Detailed information without getting too wordy for those who seek more in-depth knowledge. Professional photography, easy to find call to action for those seeking to contact the office, and an ability to quickly navigate to other areas of the site all within view. These are hallmarks of intelligent website design that is SEO friendly. 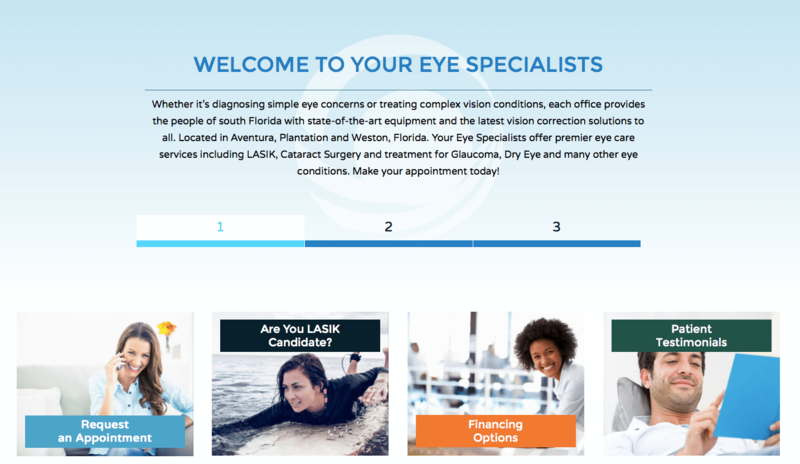 In addition to even more calls to action (Take the LASIK Quiz), we have a beautifully designed map linked to each of 4 locations for this South Florida practice desiring improved SEO and lead counts. Scroll over any location and the map pops out and lights up and for simplicity, address, phone number and other pertinent information is immediately accessible. Form meets function with a website designed using SEOversite strategies.